I thought we would all appreciate a little humor in our lives at time to time. I need to share this little funny experience our family had lately. My family contains myself, the mom, I have moderate hearing loss and try to keep our household in order. My husband is a welder that has worked in an industrial setting for more than 20 years. I have a soon 11 year old daughter that loves to roll her eyes at her mom. Last but not least a 5 year old son that has a mild hearing loss. My husband’s employer tests everyones hearing once a year. A big semi comes to the plant and parks outside and you are assigned a time to go in the booth. Well this past year my husbands hearing seemed to drop way down. I was shocked and so was he. We kept looking to see what last year and this years audiogram and I couldn’t believe the drop. I didn’t think he seemed to have a hearing loss. Maybe I am not the best judge but he doesn’t ask for things to be repeated too often. He has the tv volume much lower than I do. So we had to wait till he could get into the doctor and they do a more comprehensive test. I had a lot of worry over that time period. I am wondering would he need hearing aids. How are we going to afford this. They are not cheap at all and just forked out money for this item. I was thinking of my son who we were doing his new IEP at the time and we were putting in things like using the FM system and sitting in a certain part of the room. My mind was on overdrive and this just seemed to pull me over. Well the day came and my husband had to go in. He came home with a huge smile on his face and this is what they found…..He had fallen asleep in his first test. Can you believe that, he fell asleep. He just says well I went to work at 4:30am I was tired and that booth in the truck was so quiet and warm, and a nice chair. He fell asleep, his hearing is fine. I just had to laugh. Sometimes that is all you can do is shake your head and laugh. Life as a substitute teacher is a life of the unknown. Do I work today or not? Always a question of where to work, what grade, and what kids. I have been hard of hearing at this level for about 6 months or so. I am very new to this chapter of my life. A few people have told me, that I was proactive and didn’t stay in the land of denial and disbelief for any amount of time. I think the main reason I was proactive and ordered that first hearing aid was because I was sure I wouldn’t be able to work at the school, I wouldn’t be able to hear the kids all talking to me at once. I FEARED the loss of my job. I still have a problem with many kids talking at once, hearing aids are aids not miracles. I felt in my heart of hearts if I didn’t tackle this head on and immediately I would no longer have a job. So what changes if any did I need to make as a substitute teacher and hard of hearing. One major thing I had to do was make sure I got those calls at 6:30 in the morning. We live in a small house and only have one phone jack so one phone in the house that is not in a bedroom, living room, or the basement. I have the school call my cell phone. I can usually remember to have that with me. I also had to make sure my ringtone is nice and loud, but I also don’t want to annoy anyone else around me. The one thing I was given which I really like is this little device. This nice little battery operated stand will start brightly flashing when the phone has vibrated. This has been a great thing when I happen to be sleeping, and no hearing aids in. I don’t hear the phone call but open my eyes to a light flashing. I can call the school back and not miss those jobs. Before I had this I was missing a lot of calls and I had to do something I was dreading. I had to let our secretary know that I am hard of hearing and I am missing your phone calls not just ignoring you. I got the kindest response, just a big thank you for all the subbing I do. I am not sure why I was so scared to let someone know. I work in our local school district, which is small town and maybe 60-70 kids per grade level. A lot smaller then I was raised with. With having such a small amount of kids I know them. I have worked with them for 7 years; I have seen these kids grow. One thing I really like to use in the classroom is an FM system. I have seen these used before. Some teachers use them and some don’t. 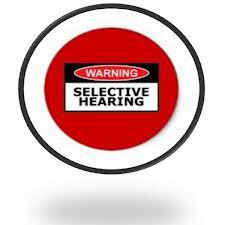 My son has an IEP and it states use of the FM system for his mild hearing loss. I try to use the FM system in every class I am in. For myself, and for students the use of the microphone is a nice way to make an effort that everyone can hear what is going on in the classroom. I try to have no one including myself left behind. There are classes that are much easier for me to teach in than others. Kindergarten through about 2nd grade really scares me. Why…they all talk to me at once in their little voices. I miss a huge amount of the content of what they are saying. I really try to implement one child at a time when I am in the class. An English class is usually an easy one, quiet and usually just reading. Now coming up I will be the agriculture teacher for three days. I know already this will be very stressful. It is a huge room with industrial fans, shop noise with industrial tech next door. I will sit facing the students and the door ( I don’t hear someone coming in the room), kids now to come up to me and face me to ask to leave class. I guess my job is the same as all subs. I just have to make sure I am aware of what is going on. Make sure my eyes are on the kids and the kid’s eyes are on me. I would like to hear about what if any changes you have had to make in your career. The past couple week for me have been ones of thinking, planning and reflecting. I feel a strong tug to do something different in my life. If that is a different job, different volunteer opportunities and different experiences. It has to be little baby steps and living in a rural area nothing is close, I don’t have a plethora of opportunities. So I made up my resume. I think it has been almost 15 years since I have done a resume. It has been a good learning experience. I have applied for a few jobs and I have been turned down for a few jobs. Last week I applied for a very unique experience. I have had a 45 minute phone interview (thank you for an amplified phone). If I would get this job I would be a literacy tutor for grades K-3 in our local school. What an awesome opportunity. To be a constant in a childs life and get them to that magical goal of reading. I hope I can be that person in a little persons life. I hope to hear this week if I will be going on to the next interview. Another part of the dreaming comes with this tutor job. At the end of my year I would receive an education gift. It is a rather good amount of money to further my education. Wow does the dreaming begin. What would I do? What would I study? I don’t know I have ideas swirling in my head faster than snowflakes in a blizzard. I am thinking deaf and hard of hearing something with that. Maybe teacher for deaf and hard of hearing or a vocational or rehabilitation counselor. Just don’t know too many decisions. Then today to start of the week with a blessing and a half. I subbed in Ag again today. I have to say it was much better today than the last time. Not one scissor got thrown across the room. I shouldn’t even have to say that. So back to the issue at hand…got home to a letter in the mailbox. I was gifted a hearing aid from the Sertoma club. I was beyond speechless and tears were flowing. I will be balanced (haha-one in both ears). This is a gift I can never repay and I am so humbled. I go to my audiologist on Thursday morning. We just had our wedding anniversary and I just feel this will be a year of changes and I pray these changes will be good ones for our family. 14 years….wow that is a long time. We are getting close to the amount of time that I will be with Chad longer than with my parents (almost 16 with dating). 14 years ago on the afternoon of April 8th I married Chad. We had a nice simple afternoon wedding. We had a small reception in the church hall and we were off to our hotel in the cities by 5pm. I watch the TLC show, Four Weddings and I am shocked but the amount of money that is spent on a wedding. Ours was simple and completely done by us. Would the majority of people be able to accept a wedding like ours? Would they be able to deal with homemade centerpieces and beautiful flowers in mason jars? To me that day was magical. I get remorseful at times and wish I would have had a big wedding with a dance and the whole shabang but you know what, I enjoyed our day. I am not a center of attention person and our wedding had DIY, family, friends and fellowship. It was our wedding and I will always cherish it. Now I am a bit of a superstitious person. Ok more than a bit, if something bad happens at 10am on a Saturday for years from that day I still will get apprehensive at 10am on a Saturday because that could happen again. We are almost done with our 13th year and for that I can breath a sigh of relief. I hate the number 13 and year 13 had a fair share of things I would like to forget and move on from. To start off our 13th year Greta, Henry, and myself were throwing up all night long. My poor husband was stripping beds, washing floors and washing buckets on our anniversary. That showed real love. Chad got a serious leg infection that was down right scary. Doctor visits, meds, and lots of prayer got him better but his leg is still not at 100%. I became hard of hearing this year. It is a new normal for me and I feel I am adjusting much better now than a few months ago but still a shock. I crashed the only vehicle I LOVED and totaled it. I had my first trip in an ambulance this year. My beloved Grandmother died this year. Just a lot of things I am glad are behind me. With all that being said there was plenty of good also. Henry started school and as much as he didn’t want to go to school he is doing great and loves it. Greta is at the “big” school now and she is doing great. Her empathy for people grows everyday and I love that about her. We got to go on a family vacation this past year to Wisconsin Dells. It was a few days of family fun that we made a lot of memories. What will this new year bring for us? I am sure there will be changes that is what life is the ever changing. The simple act of breathing and living will bring growth and change. I hope this will be a year of good changes, maybe careers, kids activities, my faith growing stronger. I want this to be a year of memories with my family and personal strides we can all make. 14 years I love Chad and the family we have made. It sure hasn’t been a path of roses but we have made a path through the vines of thorns and discovered the roses on the way.